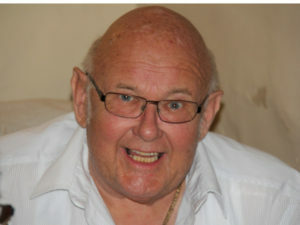 John was a long serving member of the Drama Club and will be well remembered for the cheerful and friendly disposition which touched all of those who were fortunate to also be members at that same time. John brought a great deal of enterprise to the Drama Club – particularly with his undoubted ability to keep persuading his mum (Lillian), with her highly creative couturier skills, to contribute to the cause by producing a long list of magnificent, yet unbelievably low cost costumes – as amply shown in the ‘1066 And All That’ photograph below with this ‘royal effort’ showing the results of her attendance at various local Jumble Sales! Other areas of enterprise included, somehow, and from somewhere, the acquisition of the Panel Van that shipped all the Drama Club’s Panto Scenery to Trueloves School in Ingatestone – and back again in a ‘tornado’ stricken A12 much to John’s exhaustion, and everyone else’s amusement – and indeed admiration as he returned everything intact through the school gates in the wee small hours! John’s heroics that night have understandably remained within the club’s mythology – especially amongst those who were still struggling to pass their Driving Test at that time! John met his future wife Brenda at the Drama Club and they eventually moved ‘west’ to settle, and bring up their family, in Trowbridge, Wiltshire – where his children and his grandchildren – clearly the joys of his life – still live. It appears that it was not long before John renewed both his ‘performing arts’ interests with a local Drama Club and similarly with the Sea Cadets, where he eventually became the Commanding Officer of the Unit within the town – leading them with his inbuilt enthusiasm, sense of humour and a commitment to doing the very best for those young people involved. It is also clear from what has been said by a number of those who had been Cadets under John’s leadership, that he fulfilled this role in the same way as he had experienced Cyril running the Drama Club – challenging the young people when appropriate, supporting them when needed and above all seeking to help them fulfil their individual potential. And – by the sound of it, he may – again like Cyril – have similarly thought that he was running an unofficial marriage bureau alongside his more nautical responsibilities – including for his son and future daughter in law! One of John’ other interests was in cine photography and a short video, made from his collection of old movies, is now linked on the MDC website. This includes some early footage of John, along with Gordon and Ray Aylott, who were all members (and eventually Officers) of the Sea Cadet Unit – all at the same time as managing to still be 100% involved in the Drama Club! It does seem, however, that John’s greatest role was his real life one as ‘Grandad’ (Grampy) to Alexander, Evie and Harry – his three grandchildren. John was clearly very close to all three – which is not at all surprising when you recall that he was such good fun to be with – as well, of course, as being a good and loyal friend to those who shared the same years with him in the Drama Club. Had the MDC Website started somewhat earlier than it did, it would have been easy to envisage the joy that John would have got from showing his grandchildren a bit more of his teenage years, his friends from that time and, no doubt, his recall of all the funny and creative things that he was involved in at the Drama Club.